While government budgets continue to flatten, there continues to be an increasing need for military bandwidth and protected tactical communication—these are essential for support of military and humanitarian missions. The news coming out of the vast region encompassing the Middle East and Africa is grim and often conveyed in the shorthand of single words: Ebola, ISIS, Hamas. As the President and Chief Operating Officer, Philip Harlow is driving XTAR’s business and operational growth to fulfill the company’s strategic mission. NASA is leading the way to success with its approach to working with industry to fly payloads on commercial satellites. 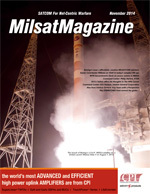 Chris Hudson is the Senior Solutions Architect Engineer at Intelsat General, and MilsatMagazine offers his in-depth expertise regarding the company’s various , upcoming Intelsat EpicNG projects, and his successful career. As most know, General John Hyten took over the leadership of the U.S. Air Force Space Command in August, succeeding General William Shelton, under whom he had been vice commander for two years.